Sen. Elizabeth Warren (D-Mass. ), the first major Democrat to enter the 2020 presidential race, is “framing her entire agenda around a single issue,” said Matt Ford in NewRepublic.com. 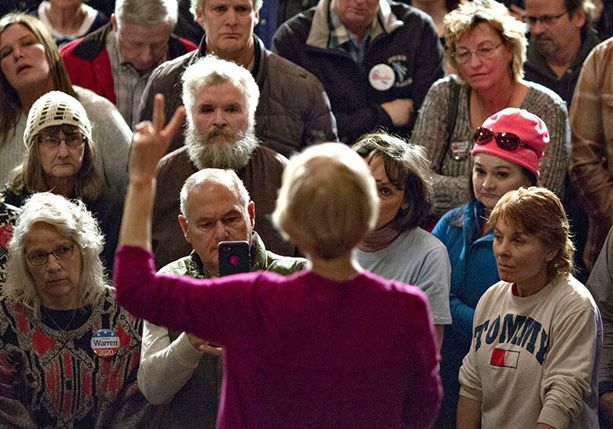 In her announcement and on a trip to primary state Iowa this week, Warren positioned herself as a champion of the middle class determined to fight corruption—in government and in an economy “rigged” to benefit corporations and the wealthy. “Billionaires and big corporations decided they wanted more of the pie,” Warren said, “and they enlisted politicians to cut them a fatter slice.” Warren offers a detailed policy agenda to achieve “fairness” and what she calls accountable capitalism: breaking up monopolies, prosecuting white-collar crime, enabling workers to elect 40 percent of corporate board members. That’s what “a serious policy intellectual looks and sounds like in 2019,” said Paul Krugman in The New York Times. In a race with 30 possible contenders, it’s encouraging to start with the focus on ideas—rather than on whether Warren is “likable” enough, as conservatives are already questioning. It sure didn’t take long for Democrats to play “the sexism card,” said Karol Markowicz in the New York Post. Fact is, Warren comes off as “stern, abrasive, and unfriendly,” and her cringeworthy attempts at seeming relatable—like drinking a beer on Instagram last week—won’t help. “We can’t point out the obvious, because she’s a woman,” yet it’s perfectly OK to publish “hundreds of articles” explaining why Sen. Ted Cruz (R-Texas) has such a “punchable” face. The 2020 nominee must be able “to withstand Trump’s abuse,” said Jonathan Tobin in TheFederalist.com, and Warren’s ill-fated decision to get a DNA test in response to Trump’s “Pocahontas” jibes only suggests she is vulnerable to being trolled by him. Warren is not the “dragon slayer” Democrats seek.